Are you an eye doctor who is looking to provide state-of-the-art medical animations to your patients to better describe their medical conditions? Are you tired of having to repeat the same medical information to your patients many times per day? Are you looking to make your medical practice more efficient through the use of IT? If so, the IMTouch Eye app for iPad can transform the way you communicate with your patients and improve the efficiency of your practice. 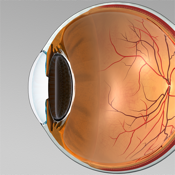 - Inform patients effectively with our 3D animations on common eye conditions, including cataract, glaucoma and AMD. - Streamline the process of informed consent for common procedures like cataract, LASIK and intravitreal injections. - Customize each animation right on the iPad, so that your voice guides patients through an explanation of their medical condition or procedure. - Pause them at any point and use the drawing tool to emphasize aspects of the animation. - Requires an existing IMTouchOnline.com account. - Periodic network access (monthly) is needed to verify your account.